To contact Torklift in Sumner, Washington, call 800-246-8132. To visit the Torklift website, go to torklift.com. For additional information, request a Torklift brochure. Torklift International tie downs are part of a truck camper tie-down and turnbuckle system. Torklift tie-downs are frame-mounted and install with no drilling on most applications. Torklift’s design incorporates four independent tie-down points that bolt directly to the truck’s frame to safely secure your camper to your truck. Torklift tie-downs are designed to fit tight and secure to your truck frame with no loss of ground clearance. Torklift tie-downs have removable inserts and are virtually invisible when not in use. Torklift tie-downs are made in the USA from steel and have a lifetime warranty. When used with any of Torklift International’s fully spring-loaded turnbuckles, Torklift warranties the truck frame and camper anchor points for the extent of the truck manufacturer’s warranty. Torklift Frame-Mounted Tie Downs come in sets of two; front and rear tie downs are sold separately. Torklift International Talon tie downs are part of a truck camper tie down and turnbuckle system. Torklift International Talon Tie Downs are frame mounted and install with no drilling on all applications. The Talon’s aluminum and stainless steel design incorporates four independent tie-0down points that bolt directly to the truck’s frame. Torklift International Talon Tie Downs are designed to fit tight and secure to your truck frame with no loss of ground clearance. Torklift International Talon Tie Downs have removable inserts and are virtually invisible when not in use. Torklift International Talon Tie Downs are made in the USA with rust free corrosion protection for life and come with a lifetime warranty. Depending on the application, Talon Tie Downs can include a combination of stainless steel and aluminum. When used with any of Torklift International’s fully spring-loaded turnbuckles, Torklift International warranties the truck frame and camper anchor points for the extent of the truck manufacturer’s warranty. Torklift Talon Tie Downs come in sets of two; front and rear tie downs are sold separately. Torklift FastGuns are part of a truck camper tie down and turnbuckle system. 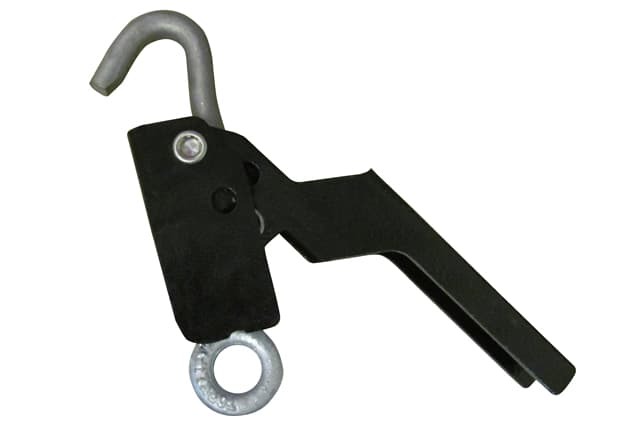 Torklift FastGuns connect and disconnect to your truck camper tie-down and anchor points in seconds using a quick release handle that features tool-free adjustments. Torklift FastGuns are available in stainless, black, hammertone grey, and white powder coat for lasting durability and are made from stainless steel. Fastguns are designed to be lightweight, lockable, and come spring-loaded with spring tension indicators to determine perfect tension for securing the truck camper. The long range Torklift FastGuns fit all frame-mounted tie-downs and rear bumper tie-downs and adjust from 25” to 43”. The short range Torklift FastGuns fit other brand bed mounted tie-downs with a reach of 14.5” to 21.5”. When used with Torklift International’s frame-mount tie-downs, Torklift warranties the truck frame and camper anchor points for the extent of the truck manufacturer’s warranty. Torklift FastGuns are made in the USA, have a lifetime warranty, and are sold in sets of two. Torklift Derringer Handles are part of a truck camper tie down and turnbuckle system. Torklift’s Derringer Handles are designed to turn old-fashioned truck camper turnbuckles into quick-disconnect lever-action turnbuckles for simple adjustment. 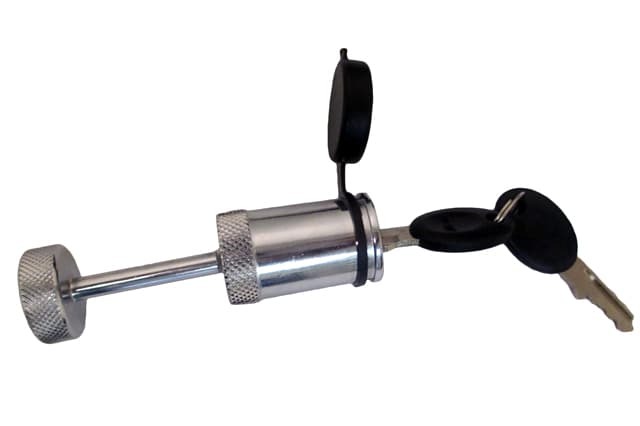 Derringer Handles connect and disconnect to your truck camper tie-down and anchor points in seconds using a quick release handle that features tool-free adjustments. Derringer Handles thread onto half-inch threaded rods on major truck camper turnbuckles and can adapt to most other turnbuckles using eyebolts. Torklift Derringer Handles are made in the USA, have a lifetime warranty and are sold in sets of four. Torklift International AnchorGuard Derringer turnbuckles are part of a Torklift International truck camper tie down and turnbuckle system. Torklift International AnchorGuard Derringer turnbuckles are made of 100% stainless steel and aircraft grade aluminum with a quick release handle that features a tool-free adjustment. The front set is spring-loaded and the rear set is cushioned to accommodate your bed/bumper mounted tie-down system (Torklift does not produce bed-mounted tie downs). Spring tension indicators determine perfect tension to secure the truck camper while in use. Driver/passenger side labels are designed to make Torklift International AnchorGuard Derringers easy to set up. Torklift AnchorGuard Derringer turnbuckles are made in the USA, have a lifetime warranty and are sold in sets of four. Torklift AnchorGuard Turnbuckles are part of a truck camper tie down and turnbuckle system. Torklift AnchorGuard Turnbuckles are stainless steel and aircraft grade aluminum. The bed-mounted turnbuckles feature spring tension indicators to determine perfect tension to hold down the truck camper while in use. Torklift AnchorGuard Turnbuckles are designed for bed-mounted tie-down systems (Torklift does not produce bed-mounted tie downs). The front AnchorGuard turnbuckle extends 19” to 23.5″. 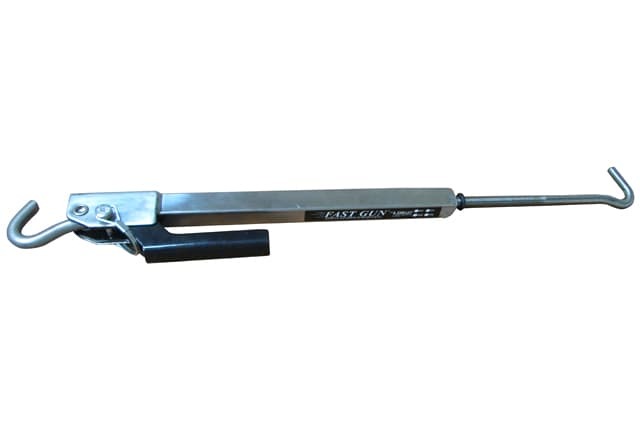 The rear AnchorGuard turnbuckle extends 26.5” to 33″. The Torklift AnchorGuard Turnbuckle kit includes four turnbuckles; two front spring-loaded turnbuckles and two rear cushioned turnbuckles. Torklift AnchorGuard Turnbuckles are made in the USA and have a lifetime warranty. Torklift SpringLoad XL turnbuckles are part of a truck camper tie down and turnbuckle system. The Torklift SpringLoad XL kit is designed for all true frame-mounted tie-downs. The lightweight SpringLoad XL turnbuckle is stainless steel and aircraft grade aluminum and features an upgraded square body for hand or tool grip and easy adjustment. The SpringLoad XL turnbuckle is designed to be an inexpensive upgrade to the Torklift Basic SpringLoad Kit (see below). Torklift SpringLoad XL turnbuckles include FastGun internal springs and spring tension indicators to determine perfect tension to secure the truck camper in use. The SpringLoad XL can be used with the Derringer Handle to turn the turnbuckles into quick-disconnect lever-action turnbuckles for simple adjustment. The SpringLoad XL has a reach of 35″ to 45″ and are sold in sets of two. Torklift’s SpringLoad XL turnbuckles are made in the USA and have a lifetime warranty. The Torklift Basic SpringLoad turnbuckle is part of a truck camper tie down and turnbuckle system. Torklift’s Basic SpringLoad turnbuckles feature a spring-loaded design to ensure a safe ride. Basic SpringLoad turnbuckles adjust in minutes. They are designed to bolt to the end of each tie down providing the suspension necessary to help protect your truck’s frame and protect your camper’s anchor points. The Torklift Basic SpringLoad Turnbuckle kit includes two quick links, two spring-loaded cannisters, two heavy-duty forged steel turnbuckles, and twenty-four inches of marine grade chain. Torklift’s Basic SpringLoad kit is made in the USA and has a lifetime warranty. The Torklift Standard Turnbuckles are part of a truck camper tie down and turnbuckle system. 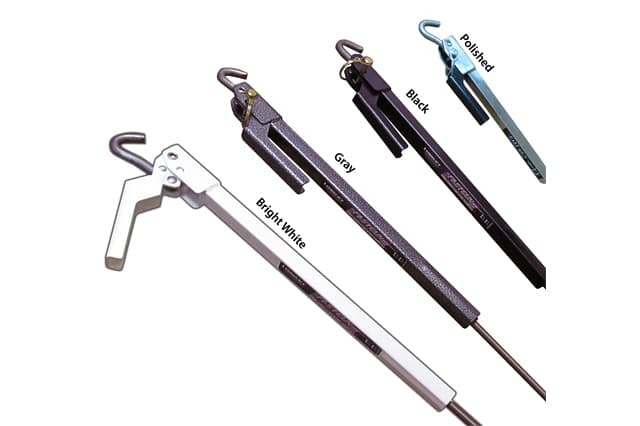 Torklift’s Standard Turnbuckles are available in both hook-to-hook and eye-to-eye turnbuckles. They are manufactured with heavy-duty forged steel and are galvanized for extreme corrosion resistance. They are affordable and simple to use. Each turnbuckle is sold separately. Torklift’s Standard Turnbuckles have a lifetime warranty. 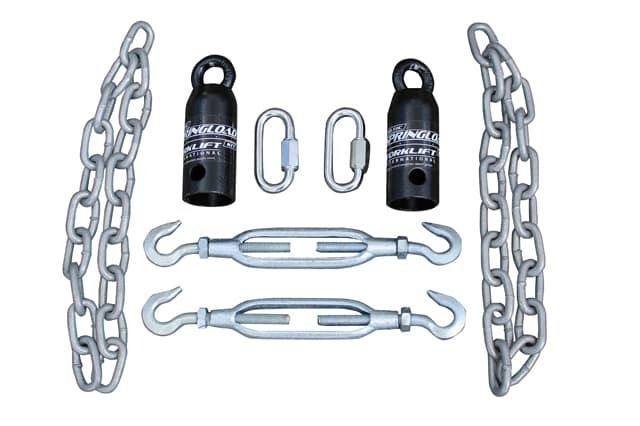 Torklift Tie Down finishing kit protects your truck camper’s tie down and turnbuckle system. The Torklift Tie-Down Finishing Kit is designed to protect your tie-downs with caps that affix to each tie-down. The Torklift Tie-Down Finishing Kit includes four caps. To install the Torklift Tie Down Finishing Kit, remove the tie down insert, replace it with the included protective foam, and cap it off with Torklift’s vinyl cap. The Torklift Tie-Down Finishing Kit was developed to be a cost effective measure to minimize the harsh effects of the environment. Torklift FastGun Locks are a lock system designed to protect Torklift tie-down and turnbuckle systems from theft. Torklift’s FastGun Locks can be used with all Torklift turnbuckles, are keyed alike, have a snap lock design, a lock and unlock feature, and weather caps to prevent weather damage and road grime. FastGun locks are available in packs of four and come with a lifetime warranty. Torklift Tie Down Locks are a lock system designed to protect Torklift tie downs from theft. Torklift Tie-Down Locks secure your Torklift steel or aluminum tie downs by securing the tie-down inserts. Tie-Down Locks come in a pack of four and are keyed alike for your convenience. Torklift Tie Down locks come with a lifetime warranty.